NWOYA. The biting poverty in most of Uganda’s countryside has forced the locals to engage in illegal wildlife trade fetching hard cash that is paid in hefty dollars on the black market. Police in the northern Uganda’s district of Nwoya over 250 kilometres from the capital Kampala, last week, arrested a couple in possession of two pangolins and their scales worth $70,000. Pangolins are one of the rarest animal species not only in Uganda but world over. The couple was looking arrested while looking for market for the pangolin scales that weighed 25 kilogrammes. 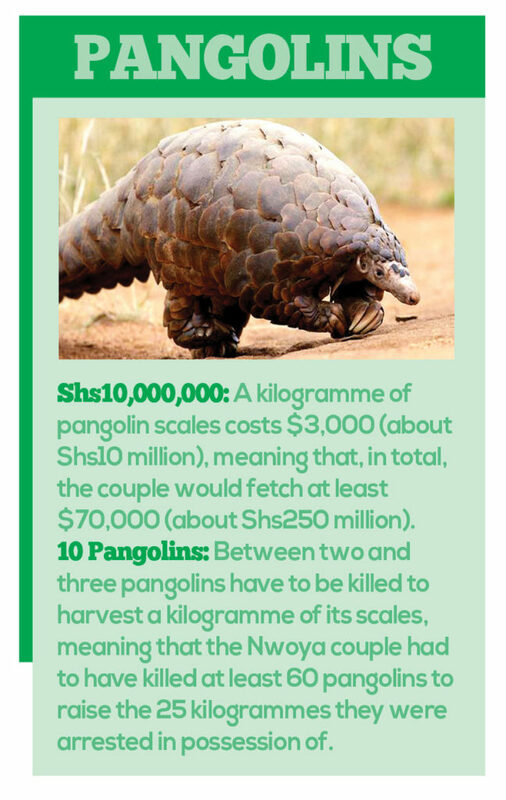 A kilogramme of pangolin scales costs $3,000 (Shs10 million), meaning that, in total, the couple would fetch at least $70,000, equivalent of Shs250 million. Being average residents of northern Uganda, Shs250 million would never be in their living memory’s worth of dreams. The suspects, Francis Okello and Consulanta Lamwaka, were arrested by in a crackdown that was mounted by officials from the Natural Resource Conservation Network (NRCN), an NGO that deals in the conservation of wildlife in the country. The pangolin has walked the earth for 80 million years. Described as a living pinecone and an artichoke with legs, it’s a toothless scaly animal that looks sort of like a snake mixed with an anteater. It’s also one of the most widely traded wild animals in the world. Northern Uganda reeled in poverty for two decades from the 1986 when President Museveni took over power and a rebel outfit, Lord’s Resistance Army (LRA) led by Joseph Kony went into action soon after. Locals were forced to live in squalid Internally Displaced Persons Camps until 2006 when peace negotiations between the Governments and LRA saw guns fall silent and Kony flee to Central African Republic where he remains holed up. The war impoverished millions to the extent that they hardly afforded daily bread and could only survive on hand-outs from Non-Governmental Organisations (NGOs). Many young and school-going children dropped out of schools. As guns fell silent and people returned to normal activity to try and recover, looking for sustainability became the biggest burden. Besides farming and small businesses, many citizens found themselves having to think beyond the conventional means and engage in other illicit activities. Poaching and trade in illegal game was one such. Including pangolin. In Uganda, pangolins are mostly found in northern region and since they are rare species of animals in the country. The scaly creatures with beady eyes, narrow snouts and long tails are highly valued for their meat that is said to be medicinal, and scales that is used for making bangles. According to the Nwoya District Police Commander, Dan Okello, the suspects confessed that biting poverty had forced them to engage in the illicit trade of wildlife since they are on high demand on the black market. Vincent Opyene, chief executive of Natural Resource Conservation Network (NRCN), said his organisation has deployed undercover crime busters in almost every district in the country to track those dealing in illegal wildlife trade. The ‘crime busters’ are backed by Police and officials from the Uganda Wildlife Authority (UWA). Arrests and seizures of poached pangolins, while overshadowed by elephants and rhino poaching, have made recent headlines. In 2015, UWA announced the seizure of two tons of pangolin skins discovered in boxes at the Entebbe International Airport, a key transit centre for the illegal wildlife trade in Central Africa. Elephants and rhinoceroses often serve as the poster animals for the illegal trade in wildlife and they are killed for the ivory in its tusks, the rhino for its horn. Pangolins live in bushes where it is easier for them to amble through the leaves and underbrush, sniffing with the long noses for security reasons and they feed on insects. Wildlife experts say the pangolin, an insectivore with a tongue longer than its body and a tail so powerful it can hang upside down from tree branches, is a far less familiar creature, is the most frequently trafficked mammal. Pangolin meat is also considered a delicacy in parts of China, where it is believed to nourish the kidneys and their scales, made of keratin, like human fingernails, are used in traditional medicine to treat skin diseases and other ailments. Customs officers seize thousands of pangolins and hundreds of pounds of pangolin scales each year, often disguised as other goods. While in countries such as; Indonesia, Vietnam and China, they put pangolin scales in ships where they are labeled as frozen fish. Opyene urged government and other stakeholders to pay more attention to these rare species like pangolin, adding that government should put in place laws that prohibit the hunting of pangolins. However, it is commonly known that Uganda has good laws but enforcement is often weak, and the incentive for local poachers in poor rural areas to catch and sell pangolins and other wildlife to middlemen for smuggling organisations is strong. The demand for pangolin meat as a delicacy is high among the newly affluent in parts of China and in Vietnam, while the animal’s scales have been used for centuries in Traditional Chinese Medicine for unproven health benefits. 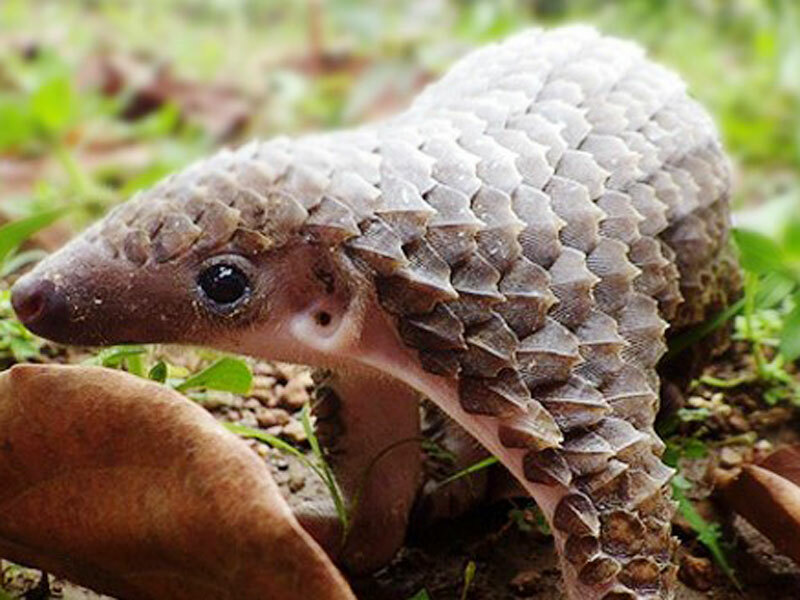 In Asian countries, pangolin meat is a delicacy that can bring over $150 in restaurants. For instance, in 2015, the New Vision newspaper reported UWA and the Ministry of Tourism, Wildlife and Antiquities had taken an unusual step of clearing Smith Ewa Maku to export seven tonnes of pangolin scales estimated at $4.2 million (Shs11 billion). By the end of November 2014, Maku had exported three tonnes of the giant pangolin scales meaning that four tonnes are remaining, the paper reported. Given that between two and three pangolins have to be killed to harvest a kilogramme of scales, it means the Nwoya couple had to have killed at least 60 pangolins to raise the 25 kilogrammes they were arrested in possession of. And if Maku honoured his deal to the last detail, it means that up to 21,000 pangolins were killed in Uganda in 2015 alone. The poaching of wildlife animals like pangolin, rhino and elephants has ascended highly across the continent of Africa over the past four years and this is fuelled by the rising demand in Asia for products coveted as a traditional medicine and or as status symbols. This has forced Uganda to be a key transit country for the illegal trade of wildlife, especially from DR Congo’s huge central African forests and the sub-Saharan trans-frontier parks.